One of my fondest memories of college is family game night. I didn’t have any actual family at college, but that didn’t stop a group of us from gathering every Saturday night to play games. There were many family game night staples (including Kill Doctor Lucky and Bang! 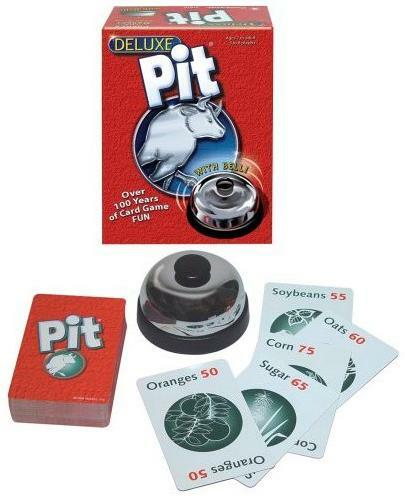 ), but one that I was introduced to there and that remains one of my favorite party games is Pit. Pit is a card game for 3-8 players (the more players the better). In Pit, players are traders trying to corner the market on a certain commodity. These commodities have varied over the years (the game was first sold in 1904), but my version has, in ascending order of point value, oranges, soybeans, oats, sugar, corn, coffee, barley, and wheat. The game simulates being in the trading pit and calling out for the commodities wanted. Pit has been around since 1904 and has seen many iterations over the years. When the dealer declares that the market is open, players can begin trading with one another (since rarely, if ever, will one player be dealt all nine cards of a commodity). But Pit is not a gentlemen’s trading game. It is simultaneous, raucous, and pure fun, start to finish. Once the market is declared open, players call out how many cards they are trading. When two players are trading the same number of cards, they pass their cards to each other, adding them to their hands. The catch is that players can only trade in sets (for example, a player cannot trade a wheat and a barley in the same trade; he must trade them individually). A player can offer to trade any number of cards in a set, up to four, but the cards must be of the same commodity. Then there are the two special cards. The bear is similar to the old maid. It is a worthless card that only takes up space in your hand, is worth -25 points at the end of the round, and even if you’ve collected the nine cards of your commodity, you cannot corner the market if the bear is in your hand. The bull, on the other hand, acts as a wild and can substitute for one card of a player’s commodity. If the player with ten cards in his hand collects all nine cards of his commodity and the bull, he scores double points for the round. But the bull is worth -25 points at the end of the round if it isn’t used, so if the round has been going on long enough, don’t be surprised if someone tries to pass you–and stick you with–the bull. When a player corners the market, that player scores the number of points listed on his commodity (from 50 to 100), and whoever has the bear (or the unused bull) scores -25 points. Play continues until one player scores 500 points. What I love about Pit is its simplicity. With a group of people who are paying attention (not always the case in a party-game session), the game can be taught and understood in about three minutes. The game itself has little to no learning curve to play, and there aren’t really ways to overthink it. Do you have friends who suffer from “analysis paralysis”? Not in Pit, they won’t. They will learn quickly that analysis doesn’t help…or they will be disappointed commodities traders. I also like that the game forces interaction. Even if a player is in the lead, it is to everyone’s benefit to trade with him (though that player will often be passed the bear–I know from experience). It keeps the energy high and can sustain that energy over multiple rounds. It also provides a point of discussion after the round is over. “You passed me the bear at the last second!” “Who was hoarding oats?” “Where is my last coffee?” “Why wouldn’t you trade with me?” “How did I end up with the bear and the bull?” Granted, the “discussion” takes the form of the game itself, loud bursts of words, but that’s okay with me. There is also a variant where you can play the game silently. This can be fun for a change–especially with quieter players who are more timid in their trades–but I prefer the original rules, yelling and all. There are few occasions in life where yelling at your friends is allowed, encouraged, and beneficial, and when it’s not taken too personally. Pit can be a good game to release that pent up energy. But I will end this post by addressing a problem I have encountered in Pit: haters. (You know who you are.) I have frequently been accused of cheating at Pit (by my family, no less! ), but I would like to set the record straight once and for all. Some people are physically built to excel at sports. I am physically built to excel at Pit. Long arms, boisterous voice, quick-thinking savvy–I use all to my advantage in Pit. (They didn’t help me in elementary school football or basketball; it’s only fair that I should get to use them sometime.) This isn’t “Harrison Bergeron.” I can’t deny who I am. Deal with it. Pit is a cheap game, generally costing a little over $10 for the cheapest version. I recommend splurging, though, and getting the version with the bell. (The cheap version has you hit a piece of cardboard, and winning the round is not nearly as gratifying. Though be prepared for gratuitous bell-ringing: it comes with the territory, even when mature folks are involved.) I should say, buy the version with the bell first. If you play this game as often as I have over the years, you will probably need to replace the cards at some point–that’s when the cheap version should come in handy. With Pit, the fun to be had far outstrips the cost. I highly recommend this game for any party game situation. A version of this review was originally posted on Tongue Fried Goat. In contrast, I seriously hate this game with the fiery heat of a thousand suns. It contains all the strategy of “Go Fish” with the addition of a room full of people yelling at each other with deafening volume while tossing cards across the table. I do not find this game fun even in the least, in fact attempting to play it tends to give me a migraine. i realise this is an old post….. i think your missing the point of the game, and there is strategy (granted not on a chess level!) and there is the silent version of the rules which is great, i always add the dealer can issue fines for noisy trading if playing these rules. I agree this game isn’t for everyone. I enjoy it quite a bit.